My hope is that this is the first pumpkin that we’ll eat, come the end of September/beginning of October. 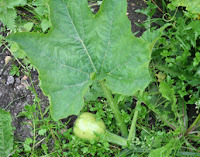 You see, we’ve been growing all these pumpkins (two plants are yielding, at least, eight pumpkins! ), but now we’re going to go to the US... just when they’ll be ripe and ready!!! Gggggrrrrrr! 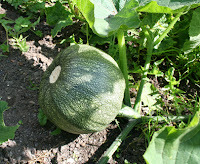 So yes, I really do hope that this little pumpkin will grow quickly enough for us to relish a pumpkin soup or pumpkin pie at the end of September. Fingers crossed! To this, in just 10 days!